I hope your summer is filled with lazy days at the beach, adventurous road trips and cherished memories with your friends and family. 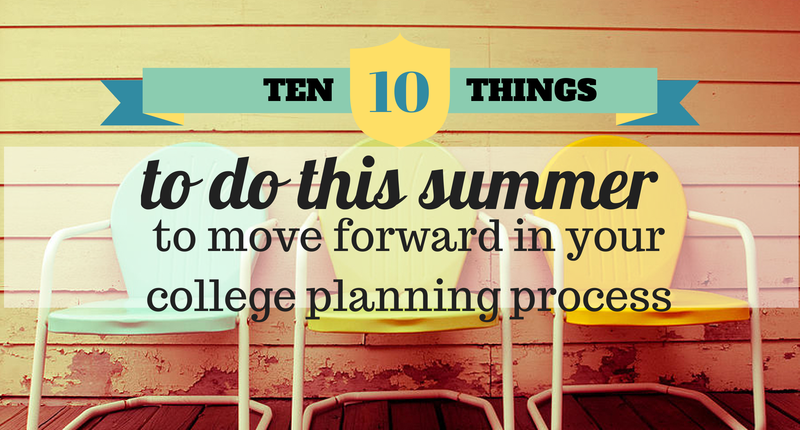 Summer is also the ideal time to continue moving forward with your college admission process to ease your workload in the Fall. Get in the mindset that you have an integral part to play in this planning process and stay on track with these tips. While you probably have required reading for your courses, take the time to read articles that interest you as well. Reading will improve everything from your vocabulary to your test scores. We all love Facebook, Instagram, Twitter and more, including college admissions officers. And believe it or not, they will be doing their social media research on you this Fall when they receive your applications. So take the time now to ensure that any posts or pictures that can be found of you online reflect the image you’d like them to see. Summer affords many families the time to visit college campuses. There is great value in taking a tour of a campus and exploring the surrounding area. Be sure to keep a journal of your impressions throughout your visit. It’s not necessary to only visit campuses you’re interested in applying to. The feeling you get from a small, rural campus will likely be similar at any small, rural campus and the same goes for a large metropolitan campus. Take notes and narrow down the characteristics you value the most! Take care not to judge any campus by the student population over the summer as most will be quiet compared to when school is in session. By now you should have narrowed down which college characteristics are most important to you. Remember that you’re shopping for the best fit school in terms of size, major, location, and cost. Be realistic based on your GPA, test scores and activities. A list of 8 schools ranging from safety, target and reach is plenty. Also be sure to have a conversation with your family regarding the potential costs of college from applications to financial aid, you should have a plan in place. The Common Application, accepted by over 500 colleges and universities, goes live on August 1st. Take some time to get familiar with it and start filling it out when you have time to spare. Collecting and inputting contact and biographical information now will save you time and stress later. If you are pursuing a degree in the arts, be sure to educate yourself on the additional elements (and costs) of the application process. Summer is a great time to prepare a photography portfolio, edit a movie or prepare a demo tape. Be sure to select an audition piece if that will be required of you and again, consider the costs of auditioning at schools. This is your chance to introduce yourself to a college and show them your value in a way that can’t be quantified from the other parts of your application. I’d recommend starting off by writing your story. Worry about fitting that story into a particular prompt later. The earlier you have a quality draft, the more time you have to refine it. Show your essay to others and accept their feedback graciously. Are you planning to take the SAT or ACT again this Fall? Have you discovered which test you prefer? Are you considering a test optional school? Do the schools on your college list require SAT Subject Tests? Don’t forget to include them in your testing timeline. Get some expert advice. Decide where your efforts will be best spent: either on continuing with testing or focusing on other parts of your application. Colleges want to admit students who are demonstrating their intellectual curiosity by taking a rigorous academic course schedule. You senior schedule should be challenging and poise you to succeed. Seek advice from your school counselor and even college admissions officers to ensure that you have selected a strong program at your high school. Recommendations from your high school instructors can speak to your potential for success in college as well as your strength of character. Don’t show up to ask for a recommendation empty handed. Utilize your summer to prepare a student resume of the highlights of your high school career as well as a copy of your personal statement. These tools will enable your recommender to write a more impactful letter. Plan to ask on the first day of school, if you haven’t already. As a rising senior, I encourage you to rest and recharge this summer so you can return to school ready for all the joys and challenges of being the academic, athletic, artistic and social leaders of your school. With the college application process well underway before school starts, you’ll have the time and energy to succeed in all facets of your high school career! As a mom to three who also wears the hat of college counselor, PAL Eulynn Gargano thinks of everything along the trajectory to future successes through the eyes of a parent and a scholar of education policy. Eulynn is the head of tutoring and test prep research & development at Futurewise Consulting. She earned her dual bachelor's degrees in English and philosophy at UCLA before earning her master's degree in education policy at NYU. Click here to learn more at www.futurewiseconsulting.com.